bebop spoken here: A Triple Treat with the Paul Donnelly Trio @ Dormans Club Middlesbrough April 19. A Triple Treat with the Paul Donnelly Trio @ Dormans Club Middlesbrough April 19. Paul Donnelly (guitar); Stuart Collingwood (keys/bass pedal); and Paul Smith (drums). 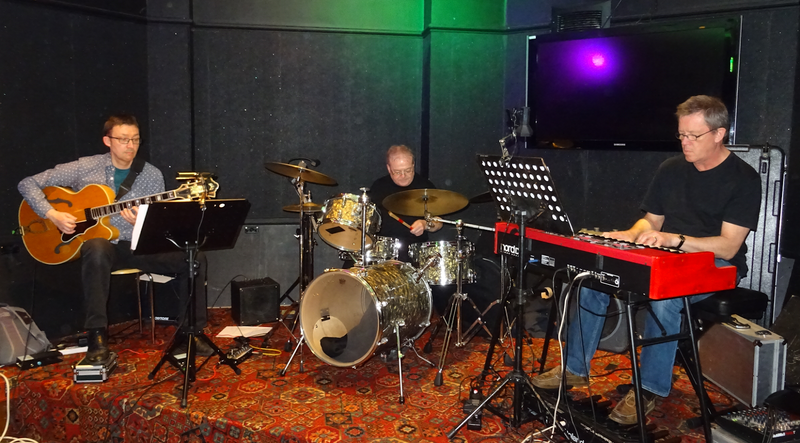 Continuing with the guest band nights at Dormans, a most successful session was held with the newly formed "Paul Donnelly Trio" playing to a full house. The three highly regarded musicians impressed the audience from the start with Monk's Straight No Chaser, followed by Work Song and the inimitable Paul Smith playing a fine solo. A mixed repertoire included This Masquerade, St.Thomas, Pat Metheny's James, Take Five, West Coast Blues with nice Wes style octave work from Paul and an interesting version of Leaving On a Jet Plane. On Jimmy Smith's The Cat Stuart played a great organ solo with fine bass pedal work. After several more numbers, the night was finished with Wes Montgomery's Jingles and an encore of Seven Come Eleven. It was satisfying to see such a good turn out which included many local musicians.